Methane-powered car proves to be impractical. Sticker on the back reads "My udder car is a Ferrari." “For the love of Mike, what have I told you about slowing down on country lanes at milking time?" It was inevitable really. She didn’t signal and her horns don’t work. "Just press the horn, that'll get her off the bonnet". "I did and it just turned upside down!" "I'm trading this for a Range Rover." One wonders Audi Farmer gets the Cow trained to lie Honda bonnet. Naomi Campbell proves she's still got what it takes at the Colorado Springs motor show. Minnie Moo refused to be cowed by old MacDonald shaking his fist and screaming "Get the f**k off my motor!" I ordered a Uber not an udder! Off to market in style. "It's unconventional, but it is indeed a decorated bonnet, so we'll have to let you enter the Easter Bonnet Parade." McDonald’s Drive-Thru. You can’t get fresher. Turn up the heating, it looks freisan out there. There are reports of a cow on the M5. "Doesn't that belong to that snotty nosed new couple with the smallholding." "Yes, I'm just delivering it to the china shop that his wife has just opened." It makes a change from picking up a sheep when you dip your lights. "These cars mainly come in graze or blacks... "
Looks like Desperate Dan is having his favourite cow pie again tonight. "C'mon, I'll be late if you don't get a MOOOOVE on." For a good finish, always leather the car off thoroughly after washing. Having won a few bob at the bookies, Paddy thought he’d set himself up with a milk delivery round. 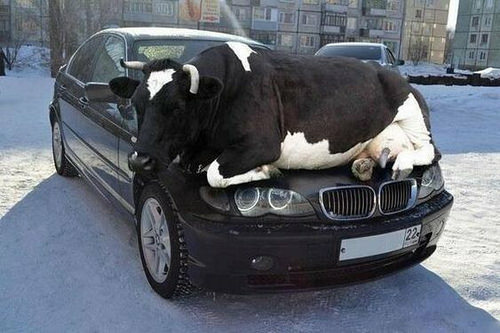 Critics slam the new bonnet ornament of Bavarian Mootor Works. Friesian cow tries to keep warm.